Actor and musician David Duchovny takes center stage in the music video for “Stranger in the Sacred Heart,” the latest offering from his 2018 album Every Third Thought via Westbound Kyd. The video features footage from the singer’s Australian tour last year. 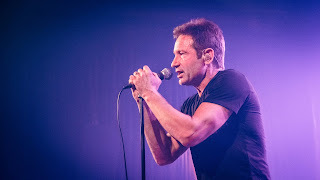 The song’s lyrics confront religion and the aftermath of his father’s passing, and Duchovny treats the live performance like a transcendental experience that reflect the deeper bonds he has to his music. In a prepared statement, Duchovny shares the background of “Stranger,” saying, “We were touring Europe and in Paris, which is where my dad died over ten years ago now, and I was thinking a lot about him and thinking what song I might sing with him in mind that night, and I was staying in Montmartre and I read about the Sacre Coeur [The Basilica of the Sacred Heart of Paris]....when I got there I was still thinking of my dad and I was told that at this church people pray not for themselves but for others, not even people they know, but humanity in general." The video drives home the wholehearted approach Duchovny takes as a performer, weaving a deeply personal meditation into a proven crowd-pleaser and connecting the message directly with fans. Duchovny continues his tour through Europe in February, with more information available here. Check out the video for “Stranger in the Sacred Heart” below.